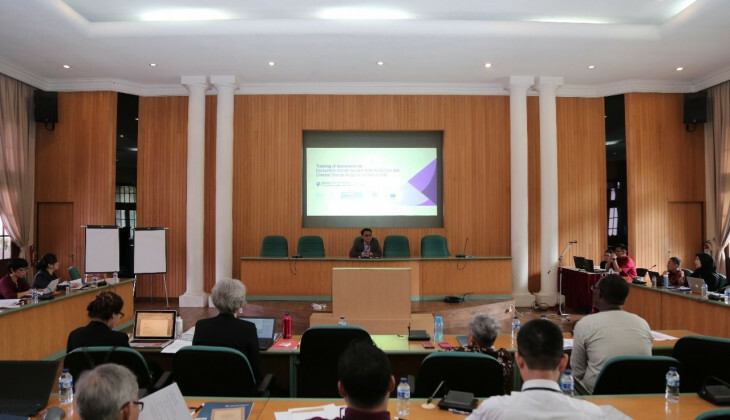 As many as 25 experts from Asia-Pacific and Africa regions took part in Training of Instructors event for ecosystem and adaptation based disaster risk reduction of climate change in Asia Pacific region, held at UGM. They are experts and researchers in disaster and environment from a number of universities and institutions in Singapore, Philippines, India, Thailand, Japan, Nepal, Indonesia, Taiwan, Kenya, and Egypt. From 18 - 22 March 2019, they would join the training conducted by Faculty of Geography UGM in cooperation with United Nations Environment Programme (UNDP), Partnership for Environment and Disaster Risk Reduction (PEDRR). Regional Coordinator for Disaster and Conflicts in the Asia Pacific, UN Environment, Dr. Lisa Guppy, said Asia Pacific was the most vulnerable region in the world which posed a serious threat to the region. Hence, disaster risk reduction is much required. “Through this event we expect to develop technologies and solution to disaster risk reduction,” she said. Disaster Risk Reduction Director, Dr. Raditya Jati, said that disaster risk efforts became important to do, including for Indonesia which is prone to flooding, earthquake, landslides, tsunami, and others. Obviously, these disasters take lives and considerable material losses. Jati explained understanding of disaster risk is the priority to face disasters. Capacity enhancement of society and government is, therefore, expected to reduce the risk. “Disaster mitigation also requires synergy between everyone, including academics and experts,” he added. Meanwhile, Dean of Faculty of Geography UGM, Prof.Dr.rer.Nat. Muh Aris Marfai, mentioned the importance of collaboration and synergy on disaster risk reduction. Participants through this forum are expected to share information and find solution to minimise the risks. Apart from the training at UGM, the participants also visited villages in Semarang, Central Java, to know more about integrated coastal areas management, coastal erosion, and disaster reduction solution based on ecosystem to strengthen society resilience.